BBC NEWS | UK | Magazine | Do they really think the earth is flat? Nasa is celebrating its 50th birthday with much fanfare and pictures of past glories. But in half a century of extraordinary images of space, one stands out. 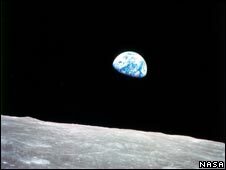 On 24 December 1968, the crew of the Apollo 8 mission took a photo now known as Earthrise. To many, this beautiful blue sphere viewed from the moon's orbit is a perfect visual summary of why it is right to strive to go into space. Not to everybody though. There are people who say they think this image is fake - part of a worldwide conspiracy by space agencies, governments and scientists. Welcome to the world of the flat-earther. Our attitude towards those who once upon a time believed in the flatness of the earth is apparent in a new Microsoft advert. Depicting an olden-days ship sailing on rough seas, presumably heading towards the "edge of the world", the advert is part of a $300m campaign aimed at rescuing the reputation of Windows Vista by comparing its critics to flat-earthers. But are there any genuine flat-earthers left? Surely in our era of space exploration - where satellites take photos of our blue and clearly globular planet from space, and robots send back info about soil and water from Mars - no one can seriously still believe that the Earth is flat? Flat earth theory is still around. On the internet and in small meeting rooms in Britain and the US, flat earth believers get together to challenge the "conspiracy" that the Earth is round. "People are definitely prejudiced against flat-earthers," says John Davis, a flat earth theorist based in Tennessee, reacting to the new Microsoft commercial. "Many use the term 'flat-earther' as a term of abuse, and with connotations that imply blind faith, ignorance or even anti-intellectualism." Mr Davis, a 25-year-old computer scientist originally from Canada, first became interested in flat earth theory after "coming across some literature from the Flat Earth Society a few years ago". "And it is at least 9,000 kilometres deep", he adds. Mr McIntyre, who describes himself as having been "raised a globularist in the British state school system", says the reactions of his friends and family to his new beliefs vary from "sheer incredulity to the conviction that it's all just an elaborate joke". So how many flat-earthers are around today? Neither Mr Davis nor Mr McIntyre can say. Mr McIntyre estimates "there are thousands", but "without a platform for communication, a head-count is almost impossible", he says. Mr Davis says he is currently creating an "online information repository" to help to bring together local Flat Earth communities into a "global community". "If you will forgive my use of the term 'global'", he says. And for the casual observer, it is hard to accept that all of this is not some bizarre 21st Century jape. After all, most schoolchildren know that ships can disappear over the horizon, that satellites orbit the earth and that if you head along the equator you will eventually come back on yourself. What about all the photos from space that show, beyond a shadow of doubt, that the Earth is round? "The space agencies of the world are involved in an international conspiracy to dupe the public for vast profit," says Mr McIntyre. John Davis also says "these photos are fake". Mr McIntyre laughs. "This is perhaps one of the most commonly asked questions," he says. 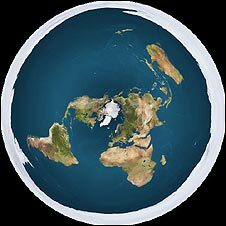 "A cursory examination of a flat earth map fairly well explains the reason - the North Pole is central, and Antarctica comprises the entire circumference of the Earth. Circumnavigation is a case of travelling in a very broad circle across the surface of the Earth." Mr Davis says that being a flat-earther doesn't have an impact on how one lives every day. "As a rule of thumb, we don't have any fears of aircraft or other modes of transportation," he says. Christine Garwood, author of Flat Earth: The History of an Infamous Idea, is not surprised that flat-earthers simply write off the evidence that our planet is globular. "Flat earth theory is one of the ultimate conspiracy theories," she says. "Naturally, flat earth believers think that the moon landings were faked, as were the photographs of earth from space." Perhaps one of the most surprising things in Garwood's book is her revelation that flat earth theory is a relatively modern phenomenon. In fact, people have known since at least the 4th century BC that the earth is round, and the pseudo-scientific conviction that we actually live on a disc didn't emerge until Victorian times. Theories about the earth being flat really came to the fore in 19th Century England. With the rise and rise of scientific rationalism, which seemed to undermine Biblical authority, some Christian thinkers decided to launch an attack on established science. Samuel Birley Rowbotham (1816-1884) assumed the pseudonym of "Parallax" and founded a new school of "Zetetic astronomy". He toured England arguing that the Earth was a stationary disc and the Sun was only 400 miles away. In the 1870s, Christian polemicist John Hampden wrote numerous works about the Earth being flat, and described Isaac Newton as "in liquor or insane". And the spirit of these attacks lives on to the present day. The flat-earth myth remains the outlandish king in the realm of the conspiracy theorist. And while we all respect a degree of scepticism towards the authorities, says Ms Garwood, the flat-earthers show things can go too far. Thanks for your comments. A selection appears below. It's interesting actually, this isn't the first time I've heard of a conspiracy like this. It is of course scientifically impossible. How does a flat object manage to be dark and light at the same time? Its impossible surely. If you take a CD, try and make the same side both hot and cold, dark and light and all points in between. It can't be done, try and do the same to a ball and suddenly it is possible. Next they will be telling us that the sun circles earth. How do "flat-earthers" explain lunar eclipses? There are two points to be made here. First, the modern flat earth society has not always insisted that the photographs from space were fakes. In the 1950s, after membership had dropped by two-thirds when the first pictures from the satellites were published, the die-hards came back with a hypothesis that the aerial view of the earth had been distorted by 'invisible and undetectable bodies' which refracted the light in such a way that it appeared spherical. It was only with the moon landings that they added the conspiracy theory that this had all taken place in the Nevada desert. The second and more important point is that this article misrepresents the history of the theory, rejecting one extreme - the idea that everyone until Columbus believed the earth to be flat, which is patent nonsense; to replace it with an equally implausible extreme, the idea that virtually the whole of western Christendom was perfectly well aware that the earth was a sphere, with exceptions such as the atypical 'cranks' like Lactantius and Cosmas of Alexandria. It simply is not true that there were no flat earth beliefs among the educated classes, and certainly not true that it was all but dead by the Middle Ages. If the earth was flat as suggested by these "theorists", a plane flying from Santiago (Chile) to Sydney (Australia) would have to cross Mexico and California before reaching its destination. Having spent many hours on that route, I can assure the world that it doesn't. The world is not a flat disc. Period. The flat-earth theory of the planet being a disc can be proven false quite easily. Simply get a satellite photo of the South Pole showing Antarctica as one landmass surrounded by water. Oh wait, they don't trust satellite photos. But they do trust aircraft. The reason planes fly routes in arcs is because this is the shortest and most efficient route on a curved sphere. Simply show that the distance/fuel consumption between two points in the Northern Hemisphere is roughly the same as between two points in the Southern Hemisphere. For example, the distance between Rio de Janeiro and Cape Town is 3775 miles, and the distance from New York to London is 3470 miles. If the disc theory was correct, it would be something like 4x as far between the Southern Hemisphere cities, since you'd have to traverse the two points further from the center of the disc (ie the North Pole). Mr Davis can even fly the plane if he wants! But, I forgot, logic has already failed these people. Why should this be any different?